Thermodynamics is a branch of science which deals with energy. Engineering thermodynamics is modified name of this science when applied to design and analysis of various energy conversion systems. Thermodynamics has basically a few fundamental laws and principles applied to a wide range of problems. Thermodynamics is core to engineering and allows understanding of the mechanism of energy conversion. It is really very difficult to identify any area where there is no interaction in terms of energy and matter. It is a science having its relevance in every walk of life. Thermodynamics can be classified as ‘Classical thermodynamics’ and ‘Statistical thermodynamics’. Here in engineering systems analysis the classical thermodynamics is employed. “Thermodynamics is the branch of physical science that deals with the various phenomena of energy and related properties of matter, especially of the laws of transformations of heat into other forms of energy and vice-versa.” Internal combustion engines employed in automobiles are a good example of the energy conversion equipment where fuel is being burnt inside the piston cylinder arrangement and chemical energy liberated by the fuel is used for getting the shaft work from crankshaft. Thermodynamics lets one know the answer for the questions as, what shall be the amount of work available from engine?, what shall be the efficiency of engine?, etc. 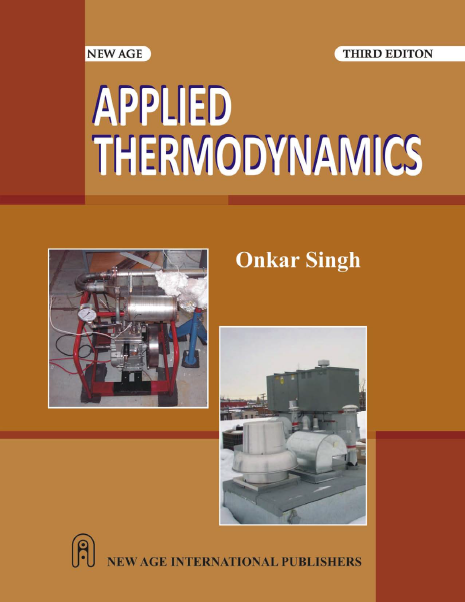 For analysing any system there are basically two approaches available in engineering thermodynamics. Approach of thermodynamic analysis means how the analyser considers the system. Macroscopic approach is the one in which complete system as a whole is considered and studied without caring for what is there constituting the system at microscopic level. Contrary to this the microscopic approach is one having fragmented the system under consideration upto microscopic level and analysing the different constituent subsystems/microsystems. In this approach study is made at the microscopic level. For studying the system the microlevel studies are put together to see the influences on overall system. Thus, the statistical techniques are used for integrating the studies made at microscopic level. This is how the studies are taken up in statistical thermodynamics. In general it can be said that, Macroscopic approach analysis = Σ (Microscopic approach analysis). “Dimension” refers to certain fundamental physical concepts that are involved in the process of nature and are more or less directly evident to our physical senses, thus dimension is used for characterizing any physical quantity. Dimensions can be broadly classified as “primary dimensions” and “secondary or derived dimensions”. “Basic dimensions such as mass ‘M’, length ‘L’, time ‘t’ and temperature ‘T’ are called primary dimensions, while quantities which are described using primary dimensions are called secondary dimensions such as for energy, velocity, force, volume, etc”. “Units” are the magnitudes assigned to the dimensions. Units assigned to “primary dimensions” are called “basic units” whereas units assigned to “secondary dimensions” are called “derived units”. Various systems of units have prevailed in the past such as FPS (Foot-Pound-Second), CGS (Centimetre- Gram-Second), MKS (Metre-Kilogram-Second) etc. but at present SI system (System-International) of units has been accepted world wide. Here in the present text also SI system of units has been used. Thermodynamics is the branch of science which deals with the energy interactions. In order to find whether energy interactions are taking place or not some measurable mathematical parameters are needed. These parameters are called thermodynamic properties. Out of number of thermodynamic properties discussed earlier the ‘temperature’ is one property. been exchange of some entity between two bars resulting in the attainment of final equilibrium temperature. This state of attainment of common equilibrium temperature is also termed as the state of thermal equilibrium. Thus, the temperature becomes a potential indicator of the energy interactions in the systems. A look at the history shows that for quantitative estimation of temperature a German instrument maker Mr. Gabriel Daniel Fahrenheit (1686-1736) came up with idea of instrument like thermometer and developed mercury in glass thermometer. Here he observed that height of mercury column used to change as the bulb of thermometer was brought in the environments having different degrees of hotness. In the year 1742, a Swedish astronomer Mr. Anders Celsius described a scale for temperature measurement. This scale later on became very popular and is known as Centigrade Scale. For caliberation of these measuring instruments some reference states of different substances were used initially and the relative state of temperature of the substance could be quantified. Later on with the passage of time things were standardised and internationally acceptable temperature scales and instruments were developed. Number of temperature measuring scales came up from time to time. The text ahead gives a brief idea of the different temperature scales used in thermometry. Different temperature scales have different names based on the names of persons who originated them and have different numerical values assigned to the reference states. (a) Celsius Scale or Centigrade Scale : Anders Celsius gave this Celsius or Centigrade scale using ice point of 0°C as the lower fixed point and steam point of 100ºC as upper fixed point for developing the scale. It is denoted by letter C. Ice point refers to the temperature at which freezing of water takes place at standard atmospheric pressure. Steam point refers to the temperature of water at which its vaporization takes place at standard atmospheric pressure. The interval between the two fixed points was equally divided into 100 equal parts and each part represented 1ºC or 1 degree celsius. (b) Fahrenheit Scale : Fahrenheit gave another temperature scale known as Fahrenheit scale and has the lower fixed point as 32 F and the upper fixed point as 212 F. The interval between these two is equally divided into 180 part. It is denoted by letter F. Each part represents 1 F.
(c) Rankine Scale : Rankine scale was developed by William John MacQuorn Rankine, a Scottish engineer. It is denoted by letter R. It is related to Fahrenheit scale as given below. (d) Kelvin Scale : Kelvin scale proposed by Lord Kelvin is very commonly used in thermodynamic analysis. It also defines the absolute zero temperature. Zero degree Kelvin or absolute zero temperature is taken as –273.15ºC. It is denoted by letter K.
Let us take water in a container and heat it from the bottom. What will happen? Container and the water inside shall start getting heated up. This heating is being sensed by either touching it or by measuring its initial and final temperatures. What has caused it to happen so? Let us take bicycle wheel and paddle it very fast, Chained wheel starts rotating very fast. Now let us apply the brake. The wheel gets stopped. What has made it to stop? Also, if we touch the brake shoe and observe its temperature it shall show that the brake shoe has got heated up. Why has it happened so? Answer for the above question lies in the energy interactions. The heating up of the container and water has been caused by the heat being added through the burner flame. Heat available in the flame is being transferred to the container resulting into temperature rise of the container and water. The fast rotation of the bicycle wheel by paddling has been due to work done in the form of paddling and causing wheel to rotate. Subsequent application of the brake has brought wheel to rest as the driving potential with the wheel is gradually dissipated due to the friction between the brake shoe and wheel. Thus the energy of wheel gets transferred to brake shoe bringing it to rest and heating up of the brake shoe (observed by the rise in temperature of brake shoe). Thus, it is obvious that there is some entity which is responsible for the above phenomenon. This entity is called the energy which is available in different forms, some times causing the wheel rotation, heating up of water etc. Similar to the cases discussed above one may look at other real life systems and understand phenomenon occurring in them. It can be concluded that it is the energy interaction in some form which is responsible for occurrence of such phenomenon. These energy interactions only permit the transformation of energy from one form to other while making the creation and destruction of energy impossible. Hence, it is true that “energy can neither be produced nor destroyed, it can only change it’s form”. The prevailing law of “energy conservation” also states the same thing. Here in this chapter we shall look into the first law of thermodynamics, heat, work and its definition, flow and non-flow work, their estimation, steady and unsteady flow processes, their analysis and limitations of the first law of thermodynamics. 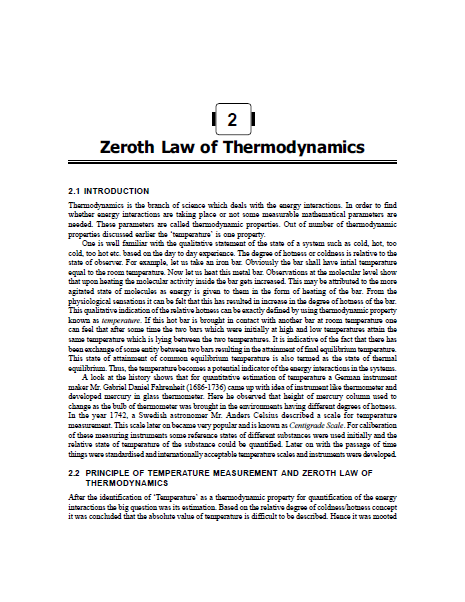 ENTROPY Introduction : Till now the detailed explanation of Zeroth law, first law and second law of thermodynamics have been made. Also we have seen that the first law of thermodynamics defined a very useful property called internal energy. 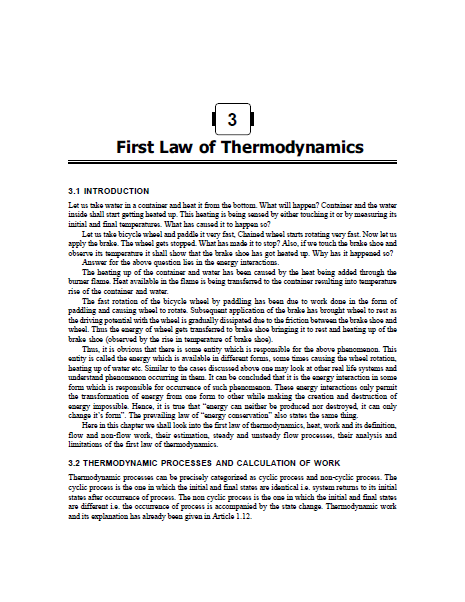 For overcoming the limitations of first law, the second law of thermodynamics had been stated. Now we need some mathematical parameter for being used as decision maker in respect of feasibility of process, irreversibility, nature of process etc. Here in this chapter a mathematical function called ‘entropy’ has been explained. ‘Entropy’ is the outcome of second law and is a thermodynamic property. Entropy is defined in the form of calculus operation, hence no exact physical description of it can be given. However, it has immense significance in thermodynamic process analysis. composition.” H2O is a pure substance as it meets both the above requirements. Any substance, which undergoes a chemical reaction, cannot be pure substance. Pure substance as defined earlier is used for operating various systems, such as steam is used for power generation in steam power plants. 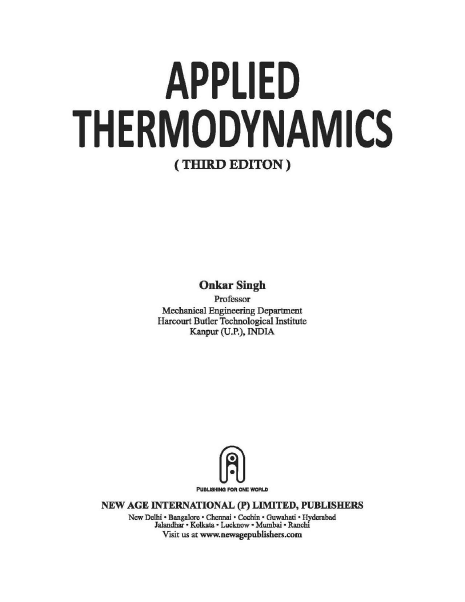 Hence, for thermodynamic analysis thermodynamic properties are required. Pressure and temperature are the properties that can be varied independently over wide range in a particular phase. Therefore, the behaviour of properties of pure substance have to be studied and mathematical formulations be made for their estimation. Various dependent properties discussed ahead shall be enthalpy, internal energy, specific volume, entropy etc. Some of terms used in discussion ahead are given as under. (a) Sensible heating: It refers to the heating of substance in single phase. It causes rise in temperature of substance. In case of cooling in above conditions it shall be called sensible cooling. (b) Latent heating: It is the heating of substance for causing its phase change without any change in it’s temperature. If heat is extracted for causing phase change without any change in its temperature it will be called latent cooling. (c) Normal boiling point: It is the temperature at which vapour pressure equals to atmospheric pressure and at this temperature phase change from liquid to gas begins. (d) Melting point: It is the temperature at which phase change from solid to liquid takes place upon supplying latent heat. (e) Saturation states: Saturation state of a substance refers to the state at which its phase transformation takes place without any change in pressure and temperature. These can be saturated solid state, saturated liquid state and saturated vapour state. For example saturated vapour state refers to the state of water at which its phase changes to steam without varying pressure and temperature. (f) Saturation pressure: It is the pressure at which substance changes its phase for any given temperature. Such as at any given temperature water shall get converted into steam at a definite pressure only, this pressure is called saturation pressure corresponding to given temperature. For water at 100°C the saturation pressure is 1 atm pressure. (g) Saturation temperature: It refers to the temperature at which substance changes its phase for any given pressure. For water at 1 atm pressure the saturation temperature is 100°C. (h) Triple point: Triple point of a substance refers to the state at which substance can coexist in solid, liquid and gaseous phase in equilibrium. For water it is 0.01°C i.e. at this temperature ice, water and steam can coexist in equilibrium. Table 6.1 given below gives triple point data for number of substances. In the present civilization the use of energy resources has increased tremendously. Fast depleting fossil fuel reserves have inevitably gathered the attention of one and all to think and devise for optimum energy utilization. In order to optimally use energy, the efforts are required for identification and elimination of the sources of inefficiency during it’s use, which obviously requires in depth study and analysis. 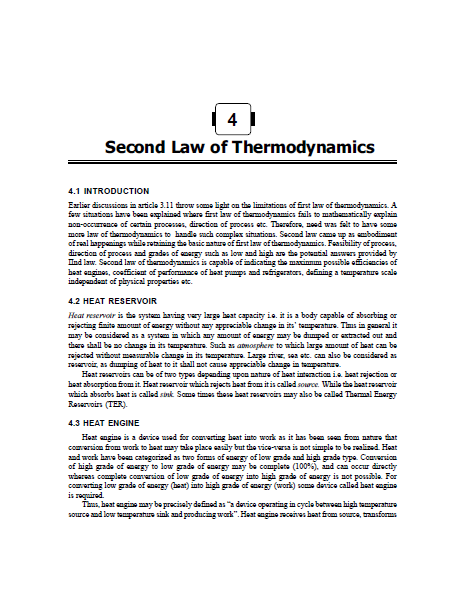 A look into the laws of thermodynamics shows that the first law of thermodynamics bases upon the series of experiments done by James Joules, demonstrating the bidirectional numerical equivalence of converting work into heat while second law of thermodynamics exhibits a unidirectional equivalence between work and heat, i.e. for a given amount of heat the equivalent amount of work cannot be obtained whereas vice-a-versa may be there. Thus, the concept of quality of energy came into existence and work is considered as high grade of energy and heat as low grade of energy. Other forms of high grade energy are electrical energy, wind energy, tidal energy etc. and low grade energy may be heat from nuclear reactions, heat from combustion of fuel etc. Engineers have been using the first law of thermodynamics stating the energy conservation, therefore it could be concluded that energy can not be destroyed and exists with matters in all forms everywhere. It is now quite convincing to understand that the scarcity of energy resources and energy crisis is a paradox. Still in real life we find scarcity of energy, as in practice one is interested in the ability to feed, drive machines and occurrence of energy processes etc. Such discussions gave birth to the concept of ‘available energy’ and ‘unavailable energy’ or a concept of ‘maximum work’. out of these propositions. Quality of energy, its convertibility into other forms and capability to perform work etc. are quantitatively defined using availability analysis. New term ‘exergy’ was introduced by Z. Rant in 1956 so as to differentiate it from energy. ‘Exergy’ analysis or ‘availability’ analysis has capability to identify and quantify the causes of thermodynamic imperfections in thermodynamic processes and thus indicate about the possibilities of improving the processes. It is preferred over energy analysis as energy analysis can not detect majority of thermodynamic imperfections. Such as the irreversible heat transfer, throttling and adiabatic combustion etc. do not have any energy loss but make the quality of energy inferior. Energy entering with fuel, electricity, flowing streams of matter and so on can be accounted for in products and by products. Energy cannot be destroyed. The idea that something can be destroyed is useful but should not be applied to ‘energy’, however it could be applied to another variable ‘exergy’. Moreover, it is exergy and not energy that properly gauges the quality (utility), say one kJ of electricity generated by a power plant versus one kJ in plant cooling water stream. Electricity obviously has greater quality and the greater economic value. (ii) Refrigeration and heat pump cycles. Here in the present text Carnot, Rankine, reheat and regenerative cycles are discussed. (ii) Refrigeration and heat pump cycles: Thermodynamic cycles used for refrigeration and heat pump are under this category. Similar to power cycles, here also these cycles can be classified as “air cycles” and “vapour cycles” based on type of working fluid used. 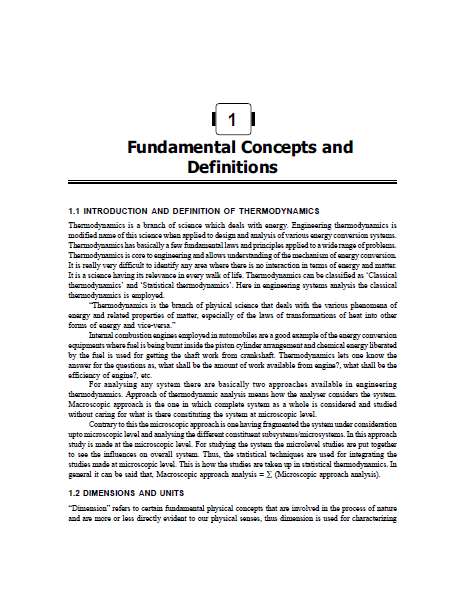 In the preceding chapter brief description is made for thermodynamic cycles comprising of both power and refrigeration cycles. In the present chapter the thermodynamic cycles operating on gas as working fluid and producing power are studied. Gas power cycles are commonly used for power production as in gas turbine plants, internal combustion engines and other applications. Here performance prediction based on thermodynamic analysis is presented for ideal cycles of different types used for gas turbine installations and internal combustion engines. (i) Air is the working fluid and behaves as a perfect gas. (ii) Working fluid does not get changed in its mass and composition. (iii) Thermodynamic processes constituting cycle are reversible. (iv) There is no heat loss from system to surrounding and vice-versa. (v) During heat addition process, heat is assumed to be supplied from a high temperature source. (vi) During heat rejection process, heat is assumed to be rejected to a low temperature sink. (vii) Specific heats of working fluid do not change throughout the cycle. After incorporating above assumptions in thermodynamic cycle analysis, the analysis done is called air standard cycle analysis. Results obtained from such analysis disagree quite largely from the actual performances due to over simplification, but to begin with, such analysis is necessary. Gradually the assumptions made may be removed and analysis becomes realistic.